This shirt is fantastic! The custom fit is perfect and everything is proportional, so everything still looks okay. The collar is great too, not too small and not too large, and you can wear a tie with this shirt comfortably without the collar itching or bunching up. The pockets are good because the very useful pen pocket is hidden, and the corners of the pocket are squared, just like Indy's. This shirt doesn't accidentally come untucked, and it doesn't itch or bother my skin when I wear it. 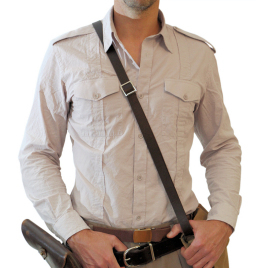 The epaulettes are also pretty much Indy accurate, and I really like them too. All in all, I give this shirt a 9 / 10. It has it's accuracy flaws, but they're nothing huge, and can be fixed with some small work.